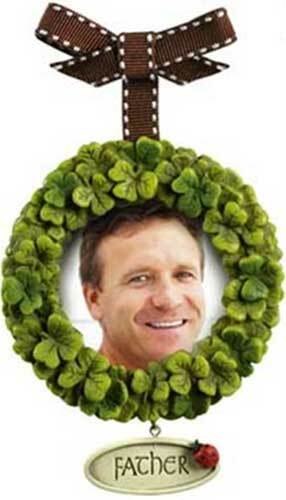 Irish Christmas ornament is an embossed shamrock wreath that also serves as a photo frame for a father. This Irish photo ornament is ready to hang on your Christmas tree with the included ribbon. This Irish ornament is a photo frame that features a dimensionally sculpted shamrock wreath border. The Irish photo frame ornament opens in the rear so that you my insert you own 2 1/2" diameter picture under the clear plastic cover; the overall design measures 3 1/2" diameter. The shamrock wreath ornament is enhanced with a charm that is embossed with the word father along with a ladybug for good luck. The Irish picture ornament is made of resin and is gift boxed with a shamrock history card, complements of The Irish Gift House. Irish Christmas ornament is a green shamrock wreath that also serves as a photo frame. Irish Christmas ornament is an embossed shamrock wreath that also serves as a photo frame for a brother. Irish Christmas ornament is an embossed shamrock wreath that also serves as a photo frame for a grandfather. Irish Christmas ornament is an embossed shamrock wreath that also serves as a photo frame for a grandmother. Irish Christmas ornament is an embossed shamrock wreath that also serves as a photo frame for a sister. Irish Christmas ornament is an embossed shamrock wreath that also serves as a photo frame for a mother.